Since our first V channel application on the M20 at Maidstone in kent for Balfour Beatty/Tarmac in the mid 90’s Sidewinder UK are the UK’s only specialists for the installation of asphalt V channel in the industry, providing a practical cost effective alternative to other forms of surface water control. 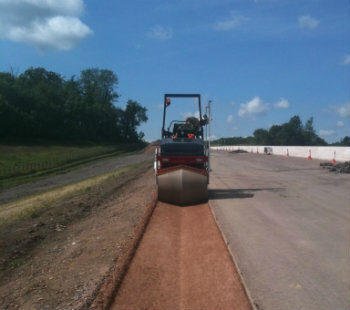 Sidewinder UK have been the leading protagonist in developing equipment and method for the construction and installation of asphalt V channel. Sidewinder UK offer years of experience gained from the installation of countless projects and design details and can offer a comprehensive service from concept to completion of installation. Construction of the V channel in basic terms involves the formation of the profile through the various layers of construction with our Sidewinders® using our purpose designed variable profile screed (V blade) with compaction being achieved with a prescribed V roller. Asphalt V channel is a lateral extension of the pavement and as such uses the finished road level and edge of pavement as the datum for level and alignment, consequently the asphalt V channel is constructed in direct relationship to the pavement leaving no void between carriageway and channel as can often be the case in concrete channel. The versatility of asphalt V channel provides an inexpensive easily programmable and quick alternative to concrete freeing up large areas of the site for other tasks to continue thus saving time on the overall contract. Further options for channel types are available in sub-base V channel, filter stone V channel or grass channel/swale. See also our Top-soiling and Seeding and Filter drain services sections. With a range of specially modified V rollers covering the most commonly used channel profiles from 1.0 meters to 2.0 meters wide we are the only company in the UK to have invested. House-keeping – less mess, less waste, no clutter e.g. no string-line, pins, washout skips or formwork. 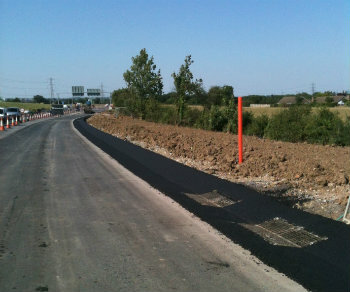 To see examples of our Sidewinders® Asphalt V Channel work in action click here. Alternatively to contact us directly click here.